Not quite the triumphant fanfare that the epic fantasy adventure series deserved to bow out on, but still an impressive conclusion to an entertaining series. During the week, you may have read an article that I published on here expressing my excitement at the release of Peter Jackson’s final jaunt through Middle Earth. After I recently watched all three of the extended edition DVD’s of The Lord of the Rings and rewatched the two Hobbit films, the most unexpected thing happened. I found out that despite previously believing these fantasy adventure films to be little more than Hobbity-tosh, they were actually rather marvellous. Full of character, personality and thrills, I could not wait to complete the set by taking myself off to the cinema and spending 144 minutes with Bilbo & Friends one final time. So, where does this third and final Hobbit film begin? It picks up directly from where the previous film left off without pausing for breath or to stroke its long and lusciously thick beard. As we saw in the closing scenes of the second movie in the series, Smaug the dragon has taken flight and is on his way to burn Lake-town to cinders to inflict revenge on the company of dwarves out to steal back their home. Perhaps an even bigger threat to our heroes is the impending arrival of an army of orcs marching towards the Lonely Mountain ready for all out war. Maybe I made a rod for my own back by over hyping the film to myself beforehand, but I genuinely was looking forward to this. However, as disappointing as it is for me to say, it was something of a let down. Whereas the previous two movies feel like lots of mini-adventures all taking place within one movie, the final part is.. well.. it’s just the third act to the second film. From the arrival of the dwarves at Bag End and Bilbo’s confrontation with Gollum in An Unexpected Journey, to the barrel riding escape plan and awakening of the dragon in The Desolation of Smaug, there’s always one more perilous quest awaiting Gandalf’s party of homeless dwarves and burglars. In that regard, this is lacking somewhat, which is no surprise when you consider the original plan was for JRR Tolkien’s The Hobbit to be adapted into two movies rather than three. The main issue is that isn’t very well concealed. This may be the shortest movie of all six films, but that’s because it’s essentially just one long battle sequence with a bit of story at the beginning and a bit more at the end. Don’t get me wrong, the battle is well shot. There’s the epic scale that is to be expected and director Peter Jackson doesn’t deny the viewer some absolutely fantastic and imaginative set pieces. It’s not like Jackson doesn’t have experience in how to shoot them by now. However, it just wasn’t satisfying like The Return of the King was. Calling it a battle sounds quite grand but it was more of a brawl with thousands of unidentifiable generic soldiers. My biggest gripe lies with the lack of humour. It’s not completely without comedy; indeed, I chuckled and sniggered during some amusing scenes. However, the dwarves simply weren’t fun characters to be around any more. A (100% CGI) Billy Connolly pops up to deliver one or two funny lines, but generally they are more concerned with the darkness enveloping their rightful king, Thorin Oakenshield, played brilliantly by Richard Armitage. In fact, the performances across the board were of a high standard again. Evangeline Lilly, Aidan Turner, Lee Pace and of course Sir Ian McKellen were all positive aspects, as was Martin Freeman as Bilbo Baggins. The only problem with Martin Freeman is that he really should’ve had more screen time. All of the best lines and most interesting plot lines come from the little hobbit. Unless of course you count Legolas declaring that “these bats are bred for one purpose; for war” to be the best line in a so-bad-it’s-good way. 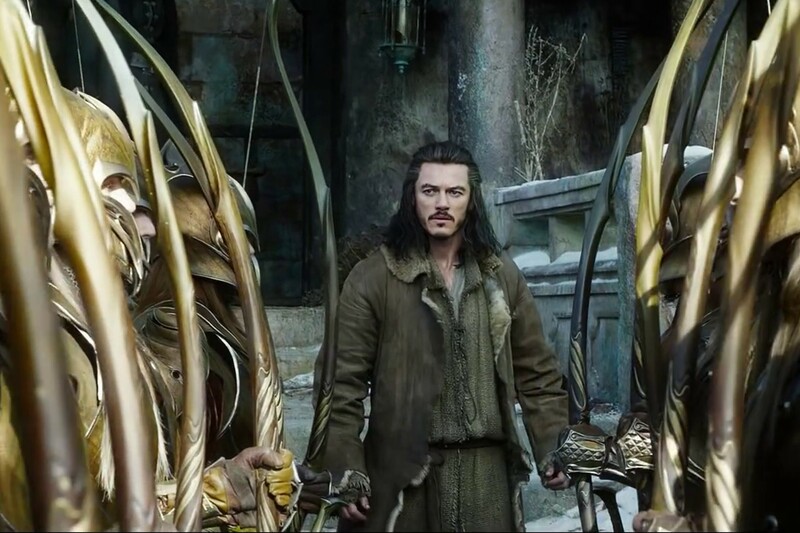 Finally, on the subject of characters and their respective actors, I really think Luke Evans as Bard is one of the best human characters from any of the Lord of the Rings / The Hobbit films so far. An honourable character whose sentiment is not over-egged, with a performance that does not seem to be discussed as much as it should. He carries the story on his own during some of the lesser moments and does so admirably. Overall, it’s still an occasionally exciting and impressive film, but undeniably lacklustre. The first two films made me laugh and had their own identity as fun, fantasy adventure films. Oddly The Battle of the Fives Armies only managed to make me laugh on a handful of occasions and as such, regardless of the fact the run time flies by (unlike An Unexpected Journey), unfortunately it just feels like Lord of the Rings-lite as opposed to the conclusion to an original and new Hobbit trilogy. The Hobbit: The Battle of the Five Armies is in cinemas right now and will be featured as the main review on our next episode of the Failed Critics Podcast, a Christmas special. Oh Dear. I’ve struggled with the previous films. Still can only name 1 or 2 dwarves, and while I like some aspects of the previous films, I just think it’s all a little much at times. I do enjoy LOTR but these films just haven’t had the same impact for me. So for you liking the first 2 films and not this one as much I’m a little less excited now about seeing this one! It’s not that I didn’t like it, because I did enjoy it mostly. It’s a good film. It’s just not in keeping with the tone of the previous two Hobbits. It’s more like a film attempting to fit in with LOTR and not quite managing it.